…What Would Your Purpose Be? Here’s the header of the Santa Cruz Good Times Local Talk column that caught my eye ten years ago, tickled my imagination and never really left. But that’s not what I came to talk about today. 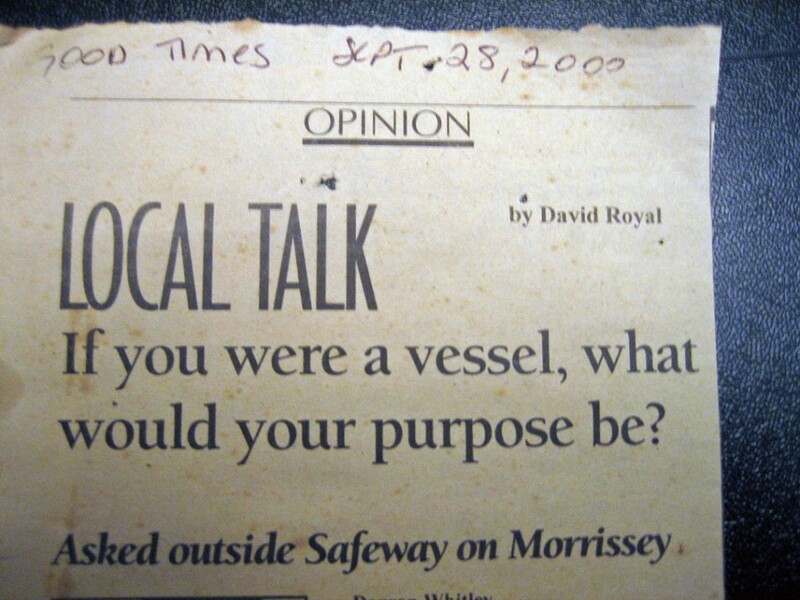 It was more about that question about being a vessel: a containing conveyance, carrier or conduit. That’s what never left my mind and why I saved this column. I was astonished at the responses’ variety: a ship, a blood vessel, a food bowl for the hungry, even a metaphoric container for religious views. It never occurred to me to be anything BUT a ceramic vessel, probably a pitcher! It is just my ceramic artist’s personal frame of reference to the word “vessel” which completely illustrates “the law of the instrument”, that we tend to overuse the familiar tool, as in “If all you have is a hammer, everything looks like a nail.” (An old saying attributed to Mark Twain and Abraham Maslow, and many others.) I like, too, the French concept of deformation professionelle which really nails it (pun intended…) “looking at things from the point of view of one’s profession.” C’est moi! So this column expanded my thinking both by jolting me in the first moment I read it and then by seeping in deeply over the years as it has hung in my studio. It has become a vessel of its own, conveying me to expanded art horizons, both conceptually and actually, and I am forever a pitcher of sweetened gratitude because of it.